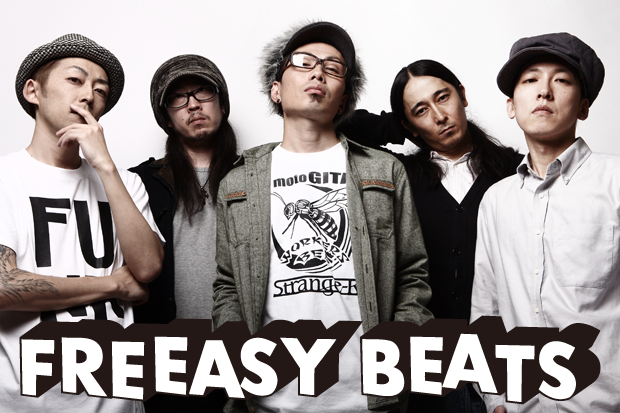 Elder brother RYO and younger brother TAKU formed Freeasy Beat in 2004. In 2006, released the major debut album “FUNKY BROS” from King Records. The 2008 release single “Eboshi” came into shape through the collaboration with FM Yokohama’s surfing program “The burn”. The song is used as the opening theme song for the TBS show “COUNT DOWN TV”. In June 2009, released the second EP “Positive Vibration”. The title track became the rooter’s song for the soccer team Yokohama FC, and the song “Image” from the same EP was used as the commercial song for Zoujiruishi, which caught the public’s attention with the inserted live scenes. The commercial aired during the Japanese “golden time”. From November 1st, 2010, their limited “Chaku Uta” wedding song “Arigato, Aishiteru”, was featured by MySpace Music Bank and was released online by Axel Mark. The song won 1st place in the download rankings 14 days consecutively. On November 1st, 2011, TSUYO-B (Gt. ), KAI the Smooth (B. ), and ZONITA (Dr.), who had been long-term support members, finally became official members of the band. This was the birth of the quintet rock band FREEASY BEATS. Their music uses rock as a base and incorporates musical ideas from various genres such as black music to create a liberal style of music.